Deploy CS-6 and Flip Clip, coming to the UK soon! 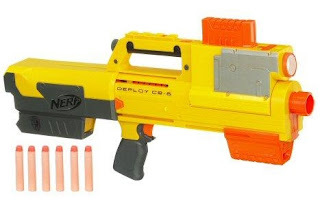 Thanks to an anonymous poster on my UK Stocklist page, I have discovered that the Deploy CS-6 and Flip Clip accessory are being released in the UK far sooner than expected. I consider this important enough news, that it gets its own post! The Deploy CS-6 is due to be released on Play.com on the 28th of May and costs £17.99. It comes with a carry strap (a first for a Nerf blaster, a welcome change in my opinion) and has a torch which requires 3 AAA batteries. Here is a great review by SG Nerf of the blaster. The Flip Clip is being released on Play.com on the 11th of June and costs £11.99. It comes with two standard 6-dart magazines, a flip clip section, and 30 Streamline darts. 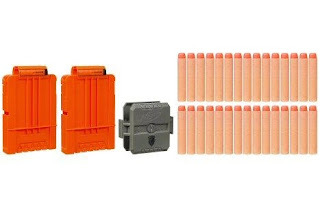 This product makes clip-system Nerf guns far more cost-effective in the UK, as before there was no way to get multiple clips other than to buy several Nerf blasters. Big Salvo Foam Rocket Launcher Mod - Get it firing normal darts! Here is great way to get a decent dart blaster with a good rate of fire and range - fully pumped between around 40ft and 60ft flat, depending on what darts you use. It will also still be able to fire the stock ROCKETS, without any range loss or switching of parts. Note that you can pump the gun less to speed up reload times and make the gun more suitable for indoor wars. This is a very simple mod, which involves 100% no unscrewing, gluing, or anything else which may be considered life-threatening complicated. Sticky (Sellotape) or electrical tape. Now I bet your thinking either "what on earth is CPVC, and where do I get it?" or "I've read about CPVC on NerfHaven, but where do I get it?" if it's the second of those two, then skip straight to the next paragraph. CPVC is piping usually used for specialist jobs like handling corrosive materials. 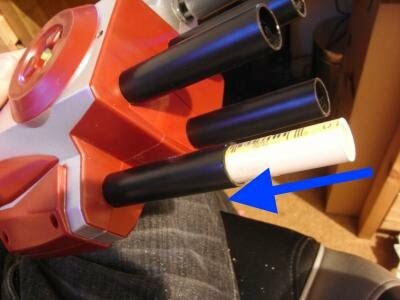 Most importantly though, it has a perfect (tight) fit for stock Nerf darts. Also it has thick walls which is good for this modification as it helps keep the new barrels in the correct place. Unfortunately 1/2" CPVC is tricky to get hold of in the UK. However I've imported some from the USA and I am selling it in pre-cut sections for £10 for four 3" length pieces, with free P&P. I have now sold out of CPVC, but may purchase more if requested. These pieces are exactly the right size for the mod and have one slightly rounded end, to allow darts to be pressed in more easily. First, get your big salvo and shoot or pull off the rockets. This will expose the black posts your going to turn into barrels. Tear, cut, ply, rip (etc.) off the "air restrictors" that are on the ends of the posts, I used pliers and quite a bit of levering on mine. Next, grab your 3" sections of CPVC. Wrap the middle in a couple of layers of sellotape, or one layer of electrical tape, then shove them into the black posts (smoother looking end outwards obviously). The CPVC should be a tight fit, so that you can push it in, but is a struggle to take it back out. Add or remove tape depending on the fit. Here it is finished! With (left to right) a streamline dart, stock rocket, fully pushed in streamline dart (improves range and accuracy a bit), and a whistler dart.